Metro Rail has emerged as a viable option to increase the share of public transport among the different modes of transport used in India. With a maximum speed of 80kmph, it is a quick, clean, reliable, safe and energy-efficient means of mass transit, providing commuters with comfort and convenience. With proper design, metro rail systems can carry up to 3-4 lakh passengers per hour. They are especially suited for cities with population greater than four million and with congested, densely built areas where location of major commercial markets and residential areas pose significant challenges to conventional efforts to reduce traffic congestion. The operation of metro rail services however requires the smooth functioning of a host of high technology enabled services. Many international rail ITS providers have been offering these services to the Indian metros. Kolkata metro was the first metro service introduced in India in 1984. Phase I of the project commenced its services in 1995 while Phase 2 and Phase 3 began in 2009 and 2010 respectively. In Delhi, the first phase of the metro was opened in 2002, and in fact it is the first railway service in the world to be registered for carbon credits. This was made possible due to the power saved using regenerative braking which reduced carbon emissions. The most successful of all metro services in India, it has a daily ridership close to about 2 million commuters. All stations have escalators, elevators, and tactile tiles to guide the visually impaired from station entrances to trains. The first stretch of Bangalore metro came into operation in 2011. This is a part of the first phase of the metro, which will have another phase and is expected to total a length of about 114km when fully completed. Metro services are close to being implemented in Gurgaon and Mumbai. More are being built in Hyderabad, Chennai, Hyderabad, Chennai, Jaipur, and Kochi. The operation of metro rail services however requires the smooth functioning of a host of high technology enabled services such as automated operations in ticketing, train movement management, passenger counting & train protection system; advanced signalling systems; on-vehicle surveillance and integrated security systems. Many international vendors have been offering these services to the different metros ? both existing and planned ? either as technology providers or as system integrators. Some of these are Siemens, Thales Group, Indra Sistemas, Alstom France and Alstom India, ABB Group and Egis India. CBTC has enabled metro rail Systems fulfil their quest to safely reduce the headway time or interval between trains and maximise train line capacity. In CTBT, trains are controlled from a central control centre and the trains? brakes are automatically applied in case of many mistakes by the driver. It is a railway signalling system that uses continuous, automatic train control. This continuous train control is possible through highly precise location of the train utilising high-capacity, bi-directional train-to-wayside communication and electronic processors in the train as well as in the wayside infrastructure. Better tracking of train location and speed results in higher capacity, greater passenger and crew safety, higher efficiency and a safer environment for rail track maintenance personnel. CBTC works on the principle of moving blocks. Traditional railway signalling systems work by marking discrete sections of the track known as blocks which are protected sections of the tracks, to detect trains, the blocks being fixed by the infrastructure. However, in CBTC, the blocks are moving because the trains continuously communicate their vital parameters such as speed, location, braking distance and travel direction to the wayside electronic equipment. This allows the wayside equipment to calculate and predict the area potentially occupied by the train at a future point of time. This also allows the system to define the points on the railway track that must not be crossed by other trains on the same track. The information about the points are continuously passed on by the wayside infrastructure to other trains on the track which automatically and continuously adjust their speed while maintaining the required safety distance and comfort (jerk-free) specifications. A typical CBTC architecture contains the following components: Onboard ATP (Automatic Train Protection) System, Onboard ATO (Automatic Train Operation) System, Wayside ATP system, Wayside ATO system, Communication system, ATS (Automatic Train Supervision) System and Interlocking System. The Onboard ATP system takes care of the continuous control of the train speed, and applies brakes when needed. It is also communicates with the wayside ATP subsystem. The Onboard ATO system handles the automatic control of train traction and braking effort necessary to keep the train under the limit established by the ATP subsystem. It primarily aids the driver?s functions. It can operate the train in a fully automatic mode also, while adhering to the preset destination and regulation targets. 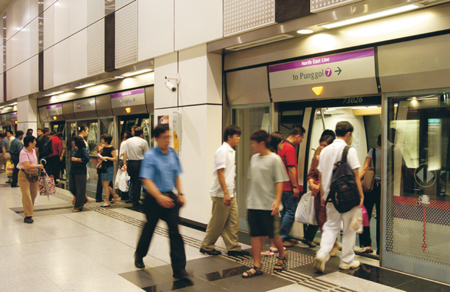 The Wayside ATP system manages the communication with the trains in its area. It also calculates the limits that each train must adhere to while travelling in the area on the track. The Communications System manages the bi-directional communication between the trains and the wayside equipment using antennas or leaky feeder cables. The Interlocking System controls the wayside objects such as switches and signals and other related functions.